Accessories Access: Lovely Lavender Handbags! From the day-to-day, I am committed to the same one handbag to get me through my shifts at work, out with my boyfriend, and everywhere in between. I’m usually wearing just one bag for as long as I possibly can before switching from a lighter spring-summer design to something darker & more durable for the fall-winter months. However, when I spot a cute bag, my heart does do a little flutter. That’s exactly what happened when I spotted these lavender bags from New York & Company. I immediately pictured how I could style them, with a head-to-toe all-white look, a floral summer frock with wedges, & a little black dress accessorized with a pop of pastel. SHOP: mini satchel, large satchel, tote, & crossbody bag @New York & Company. Would you use a lavender bag? How would you incorporate pastels with your fall wardrobe? What’s your go-to handbag style? Where do you shop for your favorite accessories? Happy Styling! Color Me Style: All You Need is Olive! One color that works well to transition from spring to summer & summer to fall is olive. It’s an earthy neutral, sometimes referred to as khaki green, that looks luxe against gold accessories or with rich leather. Also, olive touches in cargo separates offer a dressed down & utilitarian feel to more formal pieces like a sequin skirt or little black dress, presenting new options to standards in your wardrobe rotation. Olive is also a fashionable alternative to pair with denim to channel a bohemia look, additional neutrals like navy or chocolate for a layered & details ensemble, as well as pastels in peach or pink for a blend of warmth & femininity. SHOP: shirt dress @H&M, wrap dress @Kohl’s (available in sizes XS-XXL), crochet tank @Target, twill jacket @Old Navy, Audrey Brooke Viv sandal @DSW, G by Guess Beaut wedge sandal @DSW, cargo jogger pants @White House Black Market, & high low mini skirt @dressbarn. What colors are your favorite to wear each season? Where do you shop for your favorite trends? Do you like to mix cargo separates with other wardorbe pieces? Which of the above bargain finds is your favorite? Happy Styling! SHOP NOW! The Only Navy Heels You’ll Ever Need! For this summer, I’ll admit that my shoe game isn’t always the win that it could be, mostly because I’m always on the go, whether I’m headed to work, hitting up a local festival, & running errands, all while beating the heat. I’ve stuck to my favorite ballet flats, flip-flops, & most sparkling sandal flats, saving my high heels & wedges for only the most very special of occasions. This means that I haven’t made good use out of all my heels this summer (I’m nodding a bit in style shame), but comfort is also such a big deal because I’d never want how my feet feel to dictate if I’m having a good time while out with my beau or working the day away. With this, there’s one thing I can’t deny—a shoe sale! That brings me to the Taylor cut-out tie heels @dressbarn in navy. I have the blush pair, which were such a big hit when I wore them this spring (though quantities are now very slim fr the paler neutral). I had no idea that the heels also came in a navy—a tricky color for those all-blue looks when you just don’t know what to wear since navy is uncommon, as opposed to a go-to black option. I love that these heels (originally $45 & now they’re only $14.99 on sale!) are so feminine & fancy, while also lending a modern edge when matched with a fit & flare dress, blouse & skinny jeans, or graphic tee & denim skirt. Like I always say, “Oh the styling possibilities! Keep in mind that this time of year is one of the best to shop for in-season sale items, especially when there are so many coupons available (don’t delete those emails!) to get you some extra discounts on stylish finds, just like these heels! While all the fall goodies are hitting the racks, retailers are marking down perfectly wearable summer pieces (though varieties & sizes might be limited) that can elevate your summer style with bargain-priced shoes, a statement necklace, flirty shirt dress, or an on-trend, off the shoulder top. Where are you shopping for you best seasonal sale items? Would you wear these navy heels? Do you like the lace-up cut-out trend on footwear? What’s your end of the summer shopping budget? For some more affordable shopping tips, check out previous posts, including my recent adventure in pattern mixing, summer vacation must-haves, my favorite new summer-to-fall transition sweater, super cute clearance buys @TJMaxx, & colorful pom pom bags! Happy Styling! 08/02/2017 Darling of the Day: Blake Lively Embraces Hi-Low Style with Old Navy, Stuart Weitzman, Fendi & More! 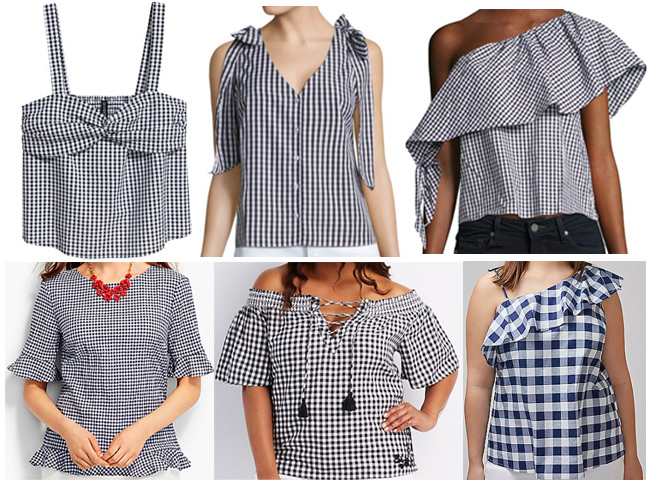 This summer is a trendy season, where tops feature all sorts of the surprises like cold shoulders, off the shoulders, cut-outs, ruffles, pleats, & keyholes. The same goes for jeans with distressed details & that ripped effect. Trends come & go, however, a classic button down & a pair of skinny jeans will stand the test of time. Former Gossip Girl actress Blake Lively is proof of just that in her latest look while taking a stroll on Long Island with family this week. What’s especially inspiring about this outfit is that Blake combines the best of hi-low fashion in a pair of Old Navy‘s Rockstar skinny jeans with designer pieces from Stuart Weitzman, Fendi, Frame, & Jennifer Meyer. SHOP: shawl collar button down shirt @Frame, Rockstar skinny jeans @Old Navy (available in sizes 0-18), Jennifer Meyer cross bar necklace @Ylang 23, Fendi minibackpack @Farfetch, & Stuart Weitzman pearl sandal @Nordstrom. The jeans are easy to find in order to recreate this look for a Style Darling on a budget. However, I found pieces that recall the essence of Blake’s effortless style with embellished details & sophisticated accessories, all of which are perfect for a summer day off. SHOP: shirt @Express, LC Lauren Conrad necklace @Kohl’s, plus shirt @Talbots, floral mini backpack @Forever 21, & pearl chunky sandals @GOjane. What’s your summer go-to look? Which classic pieces are always in your wardrobe rotation? What designer brands do you love? Who is your favorite celebrity style icon? For more celebrity inspired posts, check out Jennifer Lawrence’s NYC street style, Selena Gomez’s Vogue cover shoot, party clutches inspired by Anne Hathaway & Jennifer Hudson, white-hot summer looks on Zendaya & Olivia Culpo, & stunning red carpet appearances by Diane Kruger & Margot Robbie! Happy Styling! Inside A Style Blogger’s Closet: Black & White Pattern Mixing! When it comes to putting together an outfit, one of two things will happen for me. First, I’ll plan ahead of time for a special occasion what I’d like to wear to honor or celebrate whatever the event is—& I won’t budge away from that outfit idea. On the other hand, for day-to-day styling, I simply go by however I feel. I consider the weather, how long of a work day is ahead of me, where I’m headed socially, as well as how I’m feeling health-wise to measure how much I’m willing to fuss with a garment. While it might look like a lot goes into an outfit, sometimes spur of the moment ideas hit me & I’ve created something unique & detailed. However, when I want to experiment with my wardrobe to try something new with staple items (usually a cardigan, belt, statement necklace, or dress), my instincts lead me to pattern mixing, which is just my kind of fashion risk & something that I’ve happily & successfully explored over the last year. I love discovering the result of pairing stripes with florals or animal prints with polka dots, as well as metallics with chevron, just to have some fun while reinventing old favorites in a new way. When taking a fashion leap just such as this, I make sure that accompanying items are subtle, such as a patent leather flat, black pant, or opaque tights. Last week, I was inspired to play with some new fall finds from dressbarn, pieces that are also perfect for a cool summer afternoon too. As soon as I saw the black & white tiered floral blouse & diamond print ankle pants, I knew I loved them, but hadn’t immediately thought of putting the pieces together. A black & white color combination is possibly my favorite because of its timeless & clean vibe for any season. When I play around with mixing patterns, I always keep in mind that the best way to execute an ensemble is by keeping with the color scheme. I added an extra special touch to finish off the look with my older floral printed pointy toe flats (shop similar here), a classic denim jacket (shop here), & silver jewelry (shop similar here) since the busy patterns need neutral companion accessories. Of course, either of these pieces can be styled in multiple ways. For example, the blouse would look cute with a pretty pink cardigan & skinny jeans, but it can also be a flirty option for night with a blazer & leather leggings. The printed ankle pants are screaming for a pop of color with a bold yellow tank & cobalt heels, or with a red turtleneck for fall & embellished ballet flats. SHOP: cardigan @New York & Company, skinny jeans @Old Navy, top @Nordstrom Rack, & heels @DSW. For a little more black & white mixed print inspiration, here are a few more pieces in classic patterns like polka dots, stripes, floral, & houndstooth to get you thinking about all the ways to wear these two very versatile & chic colors. SHOP: sweater @H&M, pants @YOOX, blouse @Maurice’s, & skirt @New York & Company. Lastly, when seeking some style inspiration, I usually turn to Pinterest, which is where I can find some amazing red carpet & street style shots of my favorite fashionista celebrities who are experimenting on the daily, just like me, when it comes to mixing prints. Some admirable & professional pattern pushers are style icons Olivia Palermo, Solange Knowles, & Jamie Chung. Look how each of these fashion forward ladies uses neutrals to play up the busier pieces of their outfits, while also offering a sense of balance among the stylish chaos of their outfits. Olivia uses a black blazer as a topper, as well as gold ankle strap heels for some glamorous edge. Solange is all about yellow with her handbag & cropped pants. Finally, Jamie’s gray booties & black heels complete her effortless looks. Do you like to mix patterns in your outfits? What questions do you have about this risk-taking outlook? Which celebrities do you turn to for style inspiration? How do you feel about the classic black & white trend? Happy Styling! Living in Style: Summer Vacation Must-Haves from Francesca’s! Summer is all about fun in the sun & adventure, which means it’s time to explore each & every beautiful day. If you haven’t already gone on or planned your summer getaway, or sought out stay-cation options for a local weekend of sightseeing, now is the time to do so! I know I’ve got a beach day on the brain, listing out all the necessities for a comfortable & memorable day of relaxation & style. Here’s an opportunity for Style Darlings to make more playful & whimsical choices when it comes to wardrobe & accessories for a most fashionable day off. This also includes a few must-haves that you’ll need while travelling from one hot spot to the next, such as beach gear, food / drink items, & some extras for quiet time too! I love shopping Francesca’s for cute finds for around the house, which is why I also sought out their latest online collection of vacation-ready trends. 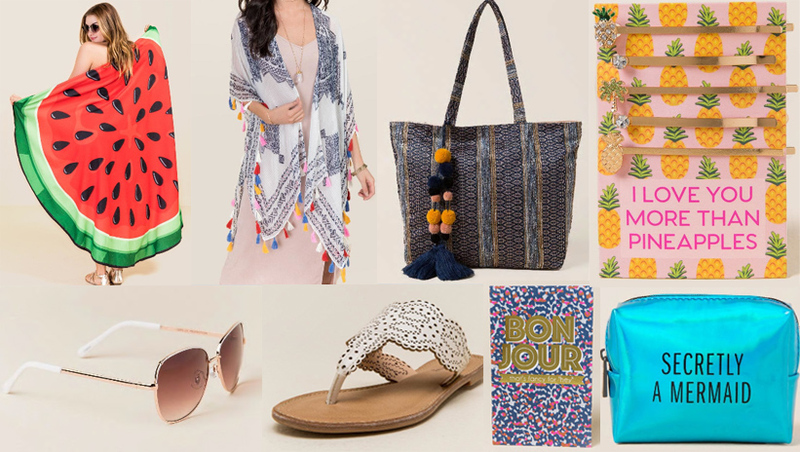 SHOP: watermelon beach blanket, tribal kimono, woven tassel tote, pineapple hair pins, aviator sunglasses, Roxette thong sandal, Bonjour journal, & Secretly A Mermaid emergency kit @ Francesca’s. Where are you headed this summer? What are some of your travel-ready favorites? Where do you shop for vacation necessities? What’s your vacation style? Happy Styling!